Whoa. 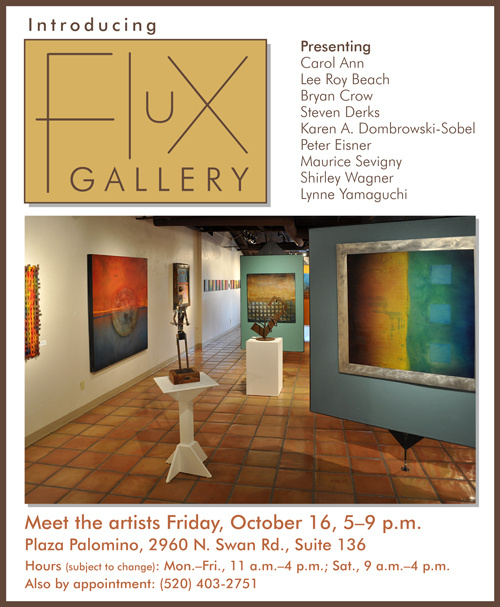 Our opening at Flux Gallery on Friday night was overwhelming. We had hundreds of people come out, a constant crowd from 5 o’clock on. The crowd didn’t begin to thin until around 8:30, after the lovely string quartet had packed up and the food was down to crumbs. (Did people not realize we still had wine left?) No doubt the article that ran in the Arizona Daily Star Friday morning helped draw folks beyond our combined mailing lists. People seemed enthusiastic about the artwork. We were certainly proud. If I can brag a little, the space looked great. Steven did a great job of hanging and displaying the work in a way that let each work both be its best self and complement the pieces surrounding it. I didn’t take photographs, but you can see some of Karen’s shots here [no longer available]. I just finished the three-day Patagonia Fall Festival and am proud to say that I won the Jury Award for the “best example of artistry or craftsmanship.” The show is in a pleasant venue and is well organized, with wonderful administrators and staff and good support for exhibitors, and I recommend it for artists and crafters with a lot of work under, say, $100. Unfortunately for me and others—and this may well just reflect the times we’re in—there didn’t seem to be a lot of high-end buyers in attendance. Even so, doing shows like this one is affirming. I received two of the highest compliments I have ever received for my work: One customer confessed to wanting to cry seeing my work; another said that being in my booth felt “like home.” Touching people in this way through my art is why I do this. Namaste. The official e-vite. Please join us for art, music, and goodies!